If you see wastewater coming out of a sewer maintenance hole on or near your property, please call us on 13 23 64 (24/7). What causes blockages and overflows? fats or solids being washed down household pipes. wet wipes and other hygiene or sanitary products being flushed down toilets. tree roots entering and growing inside pipes. stormwater entering and overloading the sewerage network. Find out what you can do around your house to help prevent blockages and overflows or download our brochure on Sewer Overflows. Dry weather overflows or blockages. Slow-draining sinks, toilets or showers, or a sewage overflow that occurs in dry weather could be a sign of a blockage in your pipes, or ours. Wet weather overflows. Stormwater and sewerage networks are separate systems, designed differently to meet different needs. On average, sewer pipes are much smaller in diameter than stormwater pipes. Sometimes rainwater can overwhelm the stormwater network and spill over into the sewer system, which causes sewage to back up and may lead to overflows. What should I do if there's a blockage or overflow? If your property has been flooded by our public sewer or if the blockage is in our pipes, please call us immediately on 13 23 64 (24/7). We will send a crew to assist. Request that we clear it for you for a fee (service available in Brisbane and Ipswich only). Please call us on 13 23 64 (24/7) and lodge a blockage removal request. Call a licensed plumber. For a referral, call the Master Plumbers' Association of Queensland on 07 3273 0800 (8am-5pm weekdays). Read more about steps you can take if your property has been damaged. Property owners are responsible for the maintenance of the private water and sewer pipes on their properties up to the connection point. In the event of a blockage or overflow at your property, you should contact a licensed plumber. 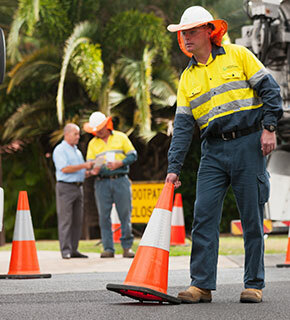 Queensland Urban Utilities maintains and operates the water and sewerage services from the network up to the property connection point. Our crews will attend to issues in our part of the network. Please call 13 23 64 (24/7) if you suspect there's been an overflow in your street. Find out more about responsibilities. there is no flooding in your local area. The problem is visible outside your property boundary (e.g. beyond your water meter). Your neighbour(s) are experiencing the same problem. There is widespread flooding in your local area.